As much as I wanted to race the Hervey Bay 100, life has just been too busy to do the training required. Missing the race is disappointing but the lack of training has taken its toll physically and mentally. I constantly spruik the benefits of regular exercise for people with asthma and COPD but realise that sometimes life gets in the way and lately it has certainly done that. For people with respiratory disease, exercise and fitness is especially important to day-to-day wellbeing – I’m living proof of this. I have still been exercising two to three times a week, but for me to feel my best, I need to be exercising five to six days a week. As a result, I’ve become more breathless and simple things like walking upstairs and even just brushing my teeth have become draining. My oxygen levels have been fluctuating being as low as 92 at times – something I haven’t seen for a couple of years – and my energy levels have also dropped quite noticeably. 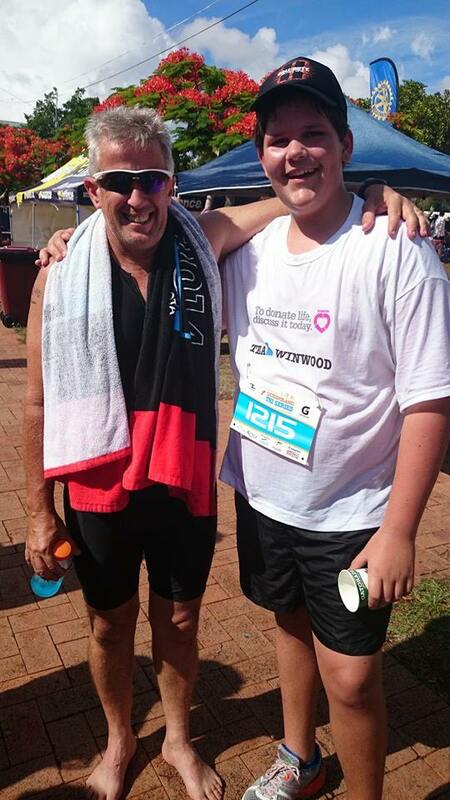 For the last four months I’ve been helping my nephew train for his first triathlon and on Sunday his dream was realised at Raby Bay in Queensland . Together, we did a team event sharing the swim, ride and run duties and it was just the tonic I needed. Watching the smile on his face when he was running down the finish chute confirmed to me that I need to make more time for exercise. At the Raby Bay finish line with my nephew. 2015 will be a busy year. I have no full Ironman events planned but still plenty of challenges. 29 March will be the Tweed Enduro – a 1.9 k swim, 90k ride and 21.1k run. In May, I’m hoping to do an 84-mile trek over three days following Hadrian’s Wall in the UK to raise awareness for asthma and lung disease in conjuction with the Andy Barker and the British Lung Foundation . 13 September will be the Sunshine Coast Half Ironman and the year will hopefully wrap up with in the New York Marathon to help raise awareness for asthma and lung disease in the US.